Pro-Ject Essential II review | What Hi-Fi? Pro-Ject’s track record with budget turntables is unrivalled. Over the years we’ve had various versions of Debuts, Genies and Essentials dominate this end of the record player market. This year it’s the turn of the Pro-Ject Essential II to shine. As the name implies this is a back-to-basics kind of product. There are no headline-grabbing materials or technologies here, just great build at a highly competitive price. 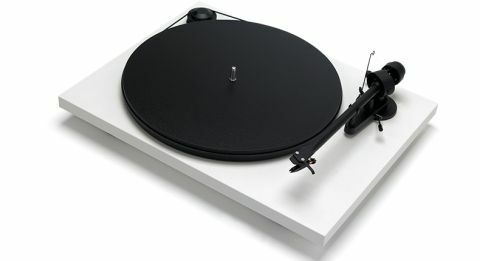 The upgrade over the original Pro-Ject Essential is substantial. There’s a new, quieter and smoother motor, a different arm (now no longer a unipivot design) and a better cartridge in the form of Ortofon’s OM5e. Want to play singles? You’ll need to manually shift the drive belt to the larger step on the motor pulley. This is as basic as turntables get, but it’s no worse off for that; the money has gone into the engineering. The main bearing is nicely made, while the arm has a quality feel, with minimal play in its bearings. We’ve come across the Ortofon cartridge before. It’s a good, solid, well-proven performer. The Essential II is available in three finishes. The standard option is matte black, which costs £200. Add a tenner and you can have red or white alternatives. Every turntable we’ve come across needs care over placement to ensure optimum performance, and that’s especially the case here. There’s little in the way of suspension, so a rigid support placed well away from the speakers is advisable if you want the best results. Do this, and the Essential 2 delivers a terrifically musical sound. Radiohead’s 15 Step shows the Pro-Ject to have a firm grasp of rhythms and strong sense of drive. There’s plenty of punch and a good level of insight into the production. The Essential doesn’t have the analysis to strip bare a recording like this, but neither does anything else at this level. What it does do is deliver the music in an exciting and entertaining way. It keeps us listening, wanting more, and that’s what makes this latest version of the Essential special. Move onto Orff’s Carmina Burana and the Pro-Ject Essential II delivers a sound that’s full of life and drama. We’re pleased by the deck’s scale and composure – these qualities aren’t very common with this kind of product. There’s a good amount of detail and enough refinement from that Ortofon cartridge to stop things getting edgy, too. Pro-Ject has done it again. The Essential II is a frill-free entry-level product that gets all the basics spot-on. It’s easy to set-up and even easier to enjoy. It makes listening to records fun, and we can’t ask much more than that.